If you've never heard of Polartec® NeoShell® fabric, let the Millet Touring Neo jacket be your introduction. With an amazing breathability of 2L/m²/sec, you will only need to use the pit zips when all out sprinting. The magic fibers that somehow let out that much moisture also achieve a waterproof rating of 10,000mm with a 245 g/m² durable water resistance coating. To put all that into English, you will always be comfortable in this thin shell specifically designed for ski touring by a company with lots of mountain experience. 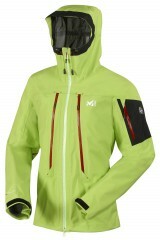 Specifically designed for ski touring by Millet. Large water-repellent zip vents can open up or down to work around your pack straps. 2 large water-repellent zipped chest pockets can stash skins or dump heat. 1 quick-access sleeve pocket for gels and such. Adjustable velcro cuffs and hem with elastic drawstring. Extremely tough yet weighs only 460 grams (1lb 0.2oz). Option to match with NeoShell pants as part of our Touring Neo Suit.